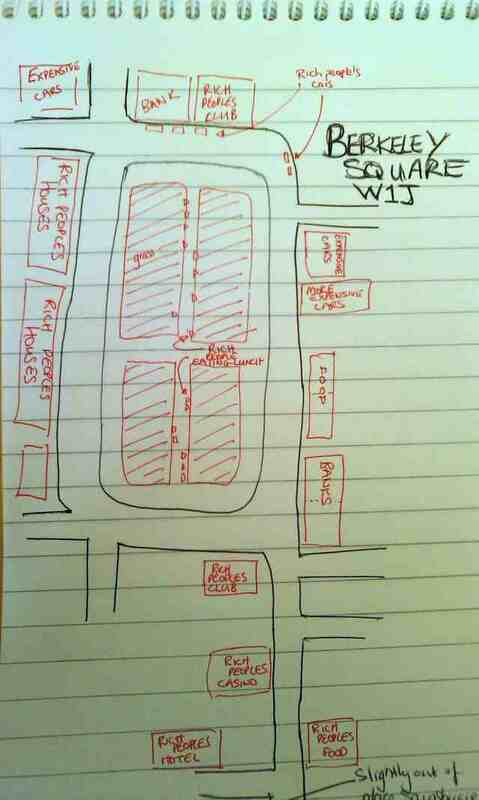 A double dose of hand-drawn mappery this week as we head over to the squares of Mayfair. The first image comes from Robin Vermeire from the Marriott Hotel, Grosvenor Square. It's a bit of a cheat, as Robin didn't draw this himself - it's taken from one of the hotel's 'really old brochures'. We love the way it distorts reality, showing Mayfair as a green, leafy place devoid of all buildings save the hotel and the American Embassy. 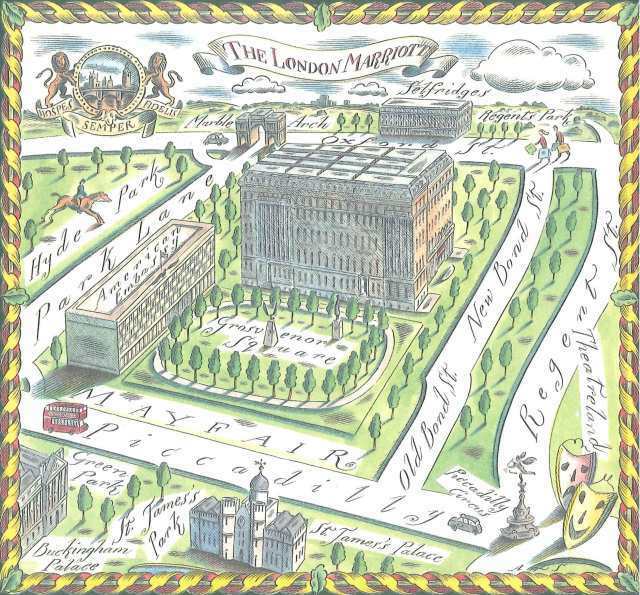 And look, Regent's Park is but a short stroll away behind Selfridges.The second map comes from Nicholas Hudgell and gives a not-too-inaccurate account of neighbouring Berkeley Square. Among the Rich People's houses and Rich People's cars he's missed the Rich People's brothel and Rich People's ghost. But, otherwise, this is more precise than the A-Z.We're still looking for further instalments in this series. Whether you're a budding Hogarth or have the artistic flair of an Etch-a-Sketch with a stuck dial we want to see your take on a local London area. Send entries to tips@londonist.com.Previously: Hampstead Heath, Notting Hill, King's Cross and Islington, Stoke Newington, central London, New Cross, Mayfair, Brixton as a tree, Pimlico.